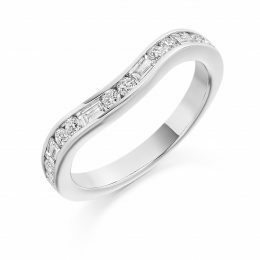 This contemporary wedding ring has both round brilliant melee diamonds and baguette diamonds channel set into the curving band. A very special and different from the norm wedding ring. This ring can be made in white, yellow or rose gold and also in platinum. Call Loyes Diamonds and book your appointment today. 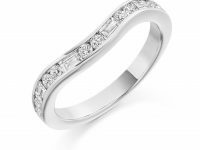 We will spend time showing you this beautiful wedding ring among others in stock and insure you find that perfect wedding ring.